Acton Capital Partners has been investing in internet companies since 1999. In addition to Etsy and HolidayCheck, the company also features several successful Munich-based startups in its portfolio such as Ciao.com, Zooplus, Mytheresa.com and Windeln.de. Christoph Braun, managing partner at Acton, talked with Munich Startup about preferences, trends, fear and missed opportunities. Christoph, please tell us about your company! Acton is a venture capital fund located in Munich. Our team has been investing in young technology-driven companies in Europe and North America since 1999. We have invested more than 350 million euros in over 65 companies so far. Do you have a preferred investment area? Do personal preferences sometimes influence your investments? We invest in young internet companies with strong growth. The absolute sales volume is not necessarily decisive for us at the point we get on board. What is important is whether the company’s growth will be rapid, profitable and sustainable in a particular market. We typically invest during Series B rounds, but also in more mature A rounds. The majority of our portfolio companies are geared towards consumers (B2C) or small to medium-sized companies (SMB). 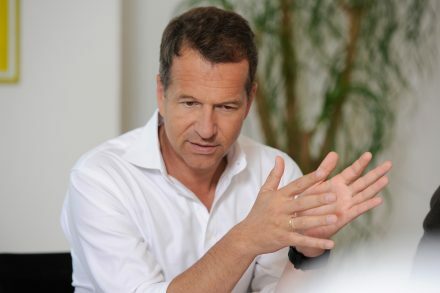 Dr. Christoph Braun, Managing Partner at Acton. A good investor should not project themselves on others, which means personal preferences should be disregarded as much as possible. I am much too curious to specialize in just a few sectors. I have been able to invest in fairly broad terms so far, ranging from market places like Etsy to software like Clio or even eCommerce sites like Zooplus or momox. Would you also invest in unfamiliar industries? We do not invest in the technology itself, but instead in a business model that works with a type of technology. Those models have always been innovative so far, but in familiar industries. We invest in companies with business models that clearly state how money is to be earned in the future. That excludes companies that are aiming for maximum distribution but still need to find their business model. Do you scout for promising companies yourself, or do you use consultants? We look ourselves and often contact companies directly. We often receive recommendations through our network or funds that got on board during an earlier stage. We also keep our eyes open for promising startups at conferences and trade shows. Not much comes from consultants. Fear would be poison, because the relationship between founders and investors requires trust above all else. A good investor gets involved as much as necessary and as little as possible. Especially in terms of strategic issues and the development of the company, we try to make a genuine contribution. After all, we want strong entrepreneurial founders whom we can actively support. The emphasis is on support. The founder will always be in the driver’s seat. So after initial contact, how long does it take to conclude a contract? That varies from case to case. An investment can be executed quickly and successfully completed in less than six weeks. Yet we often get to know companies very early on, so we initially track their development and wait for the right time to invest. … have the right idea at the right time and implement it with the right team. Founding a company and successfully establishing it on the market is not a sprint, but rather a marathon. That makes good time management essential for sustainable growth. Founders that are already thinking about an exit while making their pitch. We invest in entrepreneurs who want to be on board for the long haul and have the staying power to make their company its market leader. Every venture fund has an anti-portfolio, which are successful companies in which they could have invested. We too have turned down several companies that are now extremely successful. That is simply part of the business, as are some write-offs. Despite making sure that we have a balanced portfolio and not counting on specific victors to pay back the entire fund, not every company grows like we might have imagined. But that is also why it’s called risk capital. Sustainability! ReCommerce companies like our investment momox are leading a fundamental shift in consumer behavior. The Munich startup scene is quieter than the Berlin scene. But the focus is also different. While many startups in Berlin concentrate on B2C, Munich features a large number of B2B innovations and is braver in terms of technology. So many exciting startups arise from the TU and LMU Munich ecosystem, and they contemplate getting involved in the industrial sector early on. That is as it should be. Berlin is more playful and very strong in terms of networking among founders and startup teams, and also when it comes to sharing expertise and knowledge. That is something Munich could certainly learn. We read every pitch that is sent to us. It is best for startups to determine which team member is responsible for their subject first and to then send their pitch by email. It doesn’t work so well if emails are sent to all of our colleagues, because then it registers as spam. And those who would like to meat Acton in person should make sure to visit the Startup Day’n’Night (#SDNN) by Burda Bootcamp on 20 January – Dr. Christoph Braun will be speaking there.